It’s been a walk down memory lane over the past two days in a hearing meant to decide the status of Dr. Benny Benzeevi’s seized assets. Through two separate warrants, the Healthcare Conglomerate Associates (HCCA) CEO had $937,000 and various personal items including phones, tablets, laptops, and business documents seized by the Tulare County District Attorney’s office. Benzeevi, whose company previously managed Tulare Regional Medical Center (TRMC), is fighting to have his seized cash returned. Hon. John P. Bianco is presiding over the case; Bianco also authorized the warrants. Benzeevi’s attorneys argue that holding the cash is denying him the ability to pay for legal counsel and that the district attorney is holding onto his property, but still hasn’t filed any charges against him. His house was searched in April 2018, and his funds were seized in August 2018. The seized funds allegedly came from a transaction in which Benzeevi and HCCA’s CFO, Alan Germany, worked with Celtic Commercial Finance to sell TRMC equipment for $3m under a leaseback arrangement. The $3m was wired to Tulare Asset Management, a company owned by Benzeevi, and the lion’s share of those funds were eventually transferred to Benzeevi’s personal account. Elliot Peters, an attorney heading Benzeevi’s defense team, has argued that the transaction was allowed under the contracts between HCCA and the district, still in place at the time of the transfer. The money was owed to HCCA, he claimed, and the district board’s vote allowing HCCA to seek loans meant that HCCA’s actions were perfectly legal. Regardless of contracts or board votes, the transaction was illegal under conflict of interest laws, representatives for the district attorney’s office have said in legal filings and in court. Michael Purcell and Dane Zupon, both with Celtic Commercial Finance, took the stand Tuesday afternoon. They said HCCA officials never told them the loan wasn’t going directly to the healthcare district until the last minute when Delbert Bryant, then the district’s controller, asked for the funds to be sent to Tulare Asset Management. Even with that last-minute instruction, though, officials with the company didn’t look into it further — they simply believed the account belonged to the hospital. At the time the money was sent, Tulare Asset Management was registered at Benzeevi’s home address; the company’s business address was eventually changed to the hospital’s. Had they known the account didn’t belong to the hospital, it could have raised suspicions, Purcell, Celtic’s vice president of finance, said. Under cross-examination, Peters told Purcell that the board’s vote to allow HCCA to seek loans meant it had the legal authority to act on behalf of the district — even to fully execute the loan and eventually repay itself the amounts it was owed. The resolution specifically mentions a potential sale-leaseback, which HCCA eventually undertook with Celtic. Trevor Holly, deputy district attorney, objected, stating that while the resolution allowed HCCA to seek out a loan on behalf of the hospital, and the contract allowed it to “sweep” money from the hospital’s bank account, neither document allowed HCCA to deposit the loan proceeds into an account owned by HCCA or Benzeevi. Zupon, Celtic’s senior vice president for Syndication and Credit, told the court that HCCA officials never stated the leaseback was to repay themselves — instead, they said it was to replenish the district’s cash reserves. An investigative report filed by the district attorney’s office revealed the back-and-forth between HCCA and Celtic officials as the loan was negotiated, and as the funds from it were spent. The report, dated December 19, 2018, was prepared by the California Attorney General’s office, and details the flow of funds from the Tulare Asset Management account into other accounts, including Benzeevi’s account, which he shares with his wife. Multiple pages show the expenditures of the Tulare Asset Management, HCCA, and Benzeevi bank accounts. The report also shows the emails between HCCA and Celtic, as well as inside Celtic, as the leaseback was negotiated. “We do not plan to use the funds for acquisitions or for future sites. The anticipated new funding will go toward replenishing cash reserves due to the $26.4 MM expenditures outlined above. We also may use a portion of the proceeds to retire the existing revenue bonds, which currently total $13.6 MM,” Germany wrote to a Celtic official in one email on August 4, 2017. The documents also show that HCCA officials were seeking up to $10m at the time they negotiated the leaseback deal, and an additional $12m loan for equipment. The investigation is still ongoing, according to the report. Kevin Northcraft, president of the Tulare Local Healthcare District board, began testimony Monday, and continued into the majority of Tuesday’s session. Under questioning by Holly, Northcraft said that at one of his first meetings, he had requested, and never received, in-depth financial information on the hospital. It “became clear at some point that they did not intend” to provide the information, he told the court. He told Holly that he was never informed of multiple “requests for funds,” notices from HCCA that it had gone unpaid for operating expenses, or the subsequent promissory notes that HCCA’s CEO unilaterally signed, obligating the Tulare district to repay HCCA for those amounts. He first became aware of the fact that HCCA had loaned the hospital money when Benzeevi made an off-the-cuff remark in a June 2017 board meeting. “If the district is unable to fund things, we have the right but not the obligation to provide the funding, and HCCA has done that,” Benzeevi said at the meeting. That was his “first inkling that something may be up,” he said. Under cross-examination by Peters, Northcraft stated he was aware the hospital was losing cash; Germany told him that the cash drop was due to issues with the hospital’s electronic medical record system, he said. Peters’ questioning largely centered around HCCA’s contract at the hospital, Northcraft’s alleged bias against HCCA and its contracts, and Northcraft’s participation in various board decisions including votes against HCCA’s loan proposals. The Contract, And Board, Allowed It — Right? With dwindling cash and the continued need to make payroll, HCCA had the right under its contracts with the district to unilaterally loan the district money, and the right under the contract to repay itself for any amounts due to it, Peters said. The contract, and a limited Power of Attorney signed by former board member Sherrie Bell in 2014, gave the company the right to sign the promissory notes on behalf of the district, he added. The district’s board voted in June 2017 to allow HCCA to seek out loans on its behalf. The loan was allowed for “payment of operating expenses […], repayment of debt,” or “other Hospital purposes,” according to the board’s resolution. Gutierrez, Northcraft, and Mike Jamaica, all Tulare Local Healthcare District board members, voted to rescind that resolution in late July 2017. Peters and HCCA don’t recognize that meeting, though, or any held before she was officially recognized by the Board in September 2017, calling a series of meetings held by the three between July and September to be “purported” board meetings. Though Gutierrez was sworn in to the Tulare Local Healthcare District board before that vote took place, former board members Linda Wilbourn and Richard Torrez, with backing from HCCA and the board’s then attorney Bruce Greene, stated that Gutierrez wasn’t a member until the board declared her one — which finally happened at the September meeting. A series of events, including Wilbourn’s resignation, delayed Gutierrez’ official recognition by the board. Neither Torrez nor Wilbourn attended any meetings the three organized, and Torrez would later resign from the board. 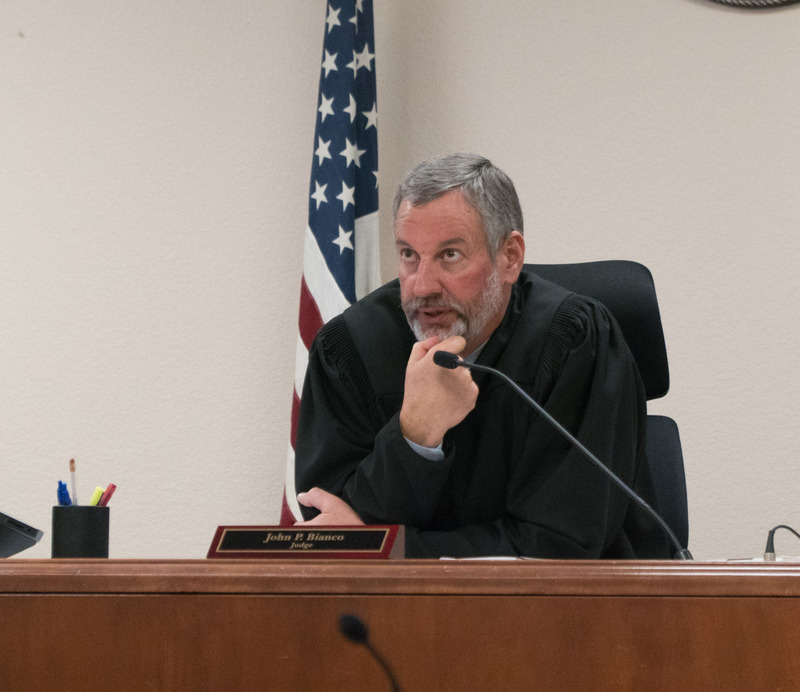 At multiple times during his cross-examination of Northcraft, Peters hinted at the idea of a conspiracy between officials in Tulare County and those opposed to HCCA’s management of the hospital. In one question, Peters asked Northcraft if he interacted with the district attorney’s office or Tulare County Superior Court judges during his tenure as the Tulare City Manager. He also asked whether the Citizens for Hospital Accountability group, opposed to HCCA, had ever held a fundraiser at Pat Hillman’s house — Hillman is the mother to Hon. Bret Hillman, a Tulare County Superior Court judge. Peters changed his line of questioning after Bianco asked if he was alleging any bias on behalf of the court, but came back to the idea of a conspiracy later in his questioning, when he claimed that the Citizens group “enlisted” the district attorney’s office, which sought, unsuccessfully, a court order to force the Tulare Local Healthcare District’s board to recognize Gutierrez as a member. Holly would later state that Benzeevi and HCCA were, in fact, the ones with a conspiracy. Dig deeper into the case with the Voice’s special page for court documents, available here. The page will be updated with available legal filings as the case continues. Hearings are scheduled to continue through next Friday, beginning at 8:30am in Courtroom 13 of the Tulare County Superior Court in Visalia. Good reporting! Very accurate from my seat in the courtroom! Hospital board members probably cannot be sued as a group but perhaps they can be sued individually. It should be something to look into. In my opinion Sherrie Bell signing such a momentous contract with HCCA without even reading it was a profound dereliction of the duties that she took an oath to do and should be sued based on all the aftermath that incurred and her blatant participation in the downfall of TRMC. Start with Bell and then go after Kumar, Wilbourn, Gadke and Torrez all individually. Their willful actions aided and abetted Benzeevi’s bleeding TRMC dry for his own financial gains. Just curious, did you even take the time to read the article or you would rather continue to share your imaginative dialogue? This article is about if it was okay for HCCA to pay itself in that manner. The district owes money to HCCA and the question is about whether the way the Celtic loan was processed was in alignment with the contract. There is no proof that the previous board members helped ” Benny to bleed TRMC dry for his own financial gains”. Apparently, he was trying to get his own money back that he loaned. Did you forget that the audits were done yearly and there was no alleged crime committed by the previous board members or HCCA. I am just surprised that Northcraft was completely unaware that the HCCA loaned the district money. How could he be so clueless? Follow the money trail, and it will tell you where the money came from and went. It is THAT simple. And simple minded people just screamed non-sense and make all kind to theatrics accusations for the sake of entertainment . And yeah, I am NOT a Benny supporter, just in case you’re thinking…I am just able to read and think on my own instead of following the crowd. Why don’t we all wait and see what will happen next before we accuse of everyone involved of being guilty. For over ten years, TRMC had been a financial failure because the CEOs and the board members and the public were not only able to work together, and continually pointing fingers as to whose fault it was for the failing of the hospital. It is a good thing that we now have the hospital open again. All this pointing fingers need to stop. Our tax dollars are being further wasted. Yeah I read it…..Benzeevi took out loan money that was meant for the hospital and deposited it in his own private coffer (Tulare Asset Management) that he setup purposely for his caper. God only knows what other monies he pilfered from the hospital and deposited into his coffer. He wouldn’t have had that ability without the help and assistance of Bell, Kumar, Wilbourn, Gadke and Torrez giving him complete and total carte blanche to do whatever he so desired. That‘s the same as holding the door open and hand carrying the note to the bank teller for the bank robber. They made sure it was so easy to happen. You focus on what you choose to focus on but as for me I will never forget what Benzeevi’s pit crew did for him so he could run his race. It is really that simple. Your and the Northcraft supporters are just saying things without evidence. Why don’t you make it easier on all of us by providing all the evidence of crimes to the DA to expedite this non-sense. Apparently you all know more than all the forensic accountants that the DA hired, who spent a truck loads of our tax dollars to investigate for over a year. The conspiracy theory was entertaining for a bit, but it is just wasting our tax dollars. HCCA loaned the district money, and yet this constant rhetoric that HCCA and the previous board members stole from the hospital. Please provide all the proofs you have to the DA. Bank transactions cannot be forfeited.